A land purchase agreement is a real estate document that’s legally binding between the purchaser and the original landowner. 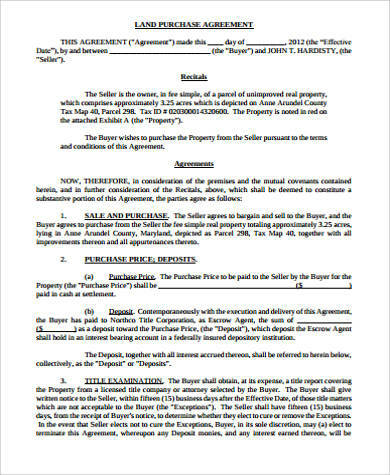 The seller may give the purchaser an installment term either through a bank or financing agency, or may offer the terms himself by providing financing to the buyer. This usually comes with a mutually agreed upon price that the buyer can later repay through a series of installments. 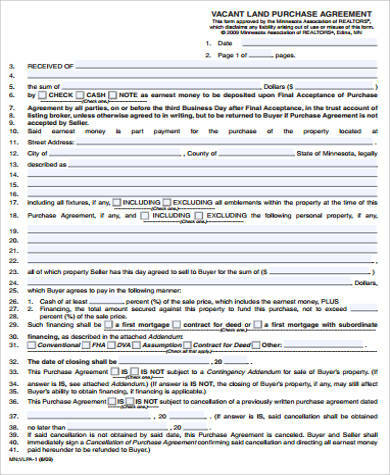 Our Sample Forms for land purchase agreements are intended to indicate the general nature of such agreements that users can use as reference to draft their own agreements. These are all free for downloading and can be modified or edited according to the specifications of the agreement. 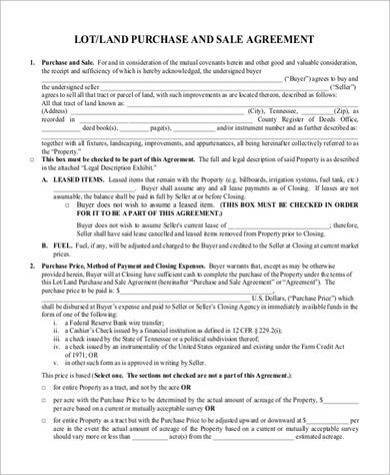 In a land purchase agreement, the seller usually retains ownership of the property until the buyer makes full payment of the property based on the agreed price. 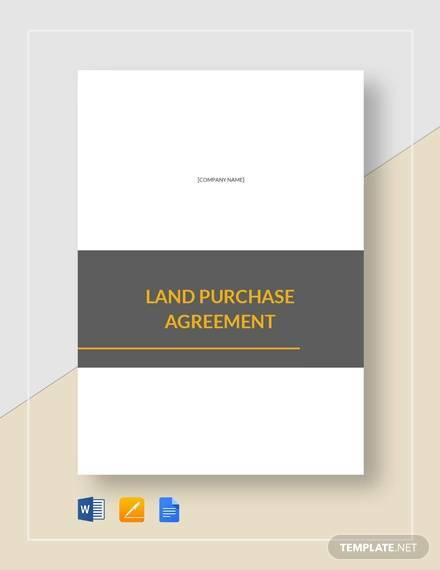 A land purchase agreement need not be complicated, and the draft should include the terms and conditions for the benefit of both the buyer and the seller. Upon full obligatory satisfaction of all contract terms and payment, the seller should then hand over ownership of the real estate to the buyer through issuance of a deed to transfer the title of ownership. option to terminate agreement applicable to both parties. In most instances, it’s common for installment payments on the property to be the same as mortgage payments determined through a monthly amortization schedule. 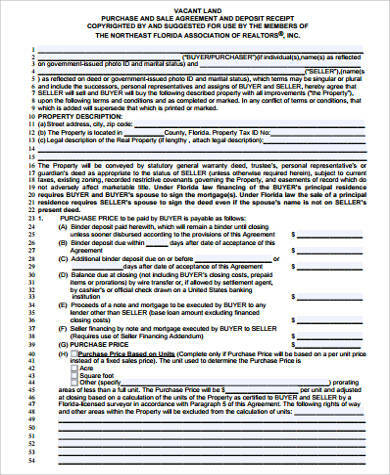 In this case, the buyer’s payment on the property is both a partial payment as well as an interest payment of the mortgage of the property. The longer the buyer pays on the payments, the larger his equity share of the property becomes. However, in cases where the buyer defaults on the payments, there is a danger that the equity would revert to the seller by citing a breach of contract. 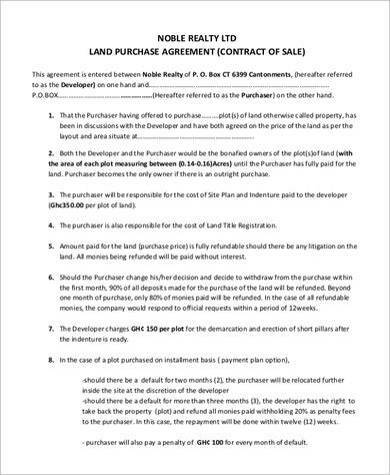 It may be important for both the buyer and the seller to agree on such provisions before signing the land purchase agreement. 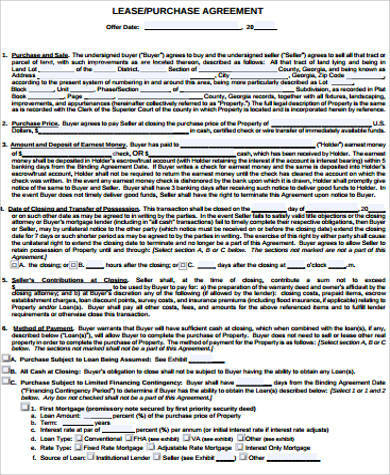 Please check out our website’s Free Lease Agreement Forms that can be downloaded and used for general lease agreements with standard basic rules that users can modify or edit according to their own specifications. Based on our samples being given, land purchase agreements can be written or modified depending on the seller and buyer’s agreement. This is particularly useful for repayment plans that need to be ironed out by both parties. Like a lot of big purchases, real estate properties may have a third-party financing option details included in the agreement that details the loan the buyer can make to help purchase the property. Our sample forms provide the basics with which the buyer and seller will be guided accordingly. The standardized agreement samples need to be thoroughly understood by both parties before each should sign the agreement. 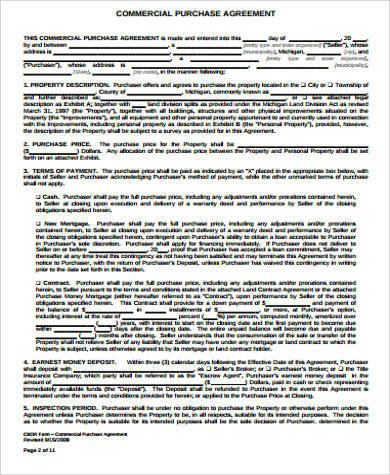 The agreement can only bind both parties once they accept and sign the terms of any offer or counteroffer. 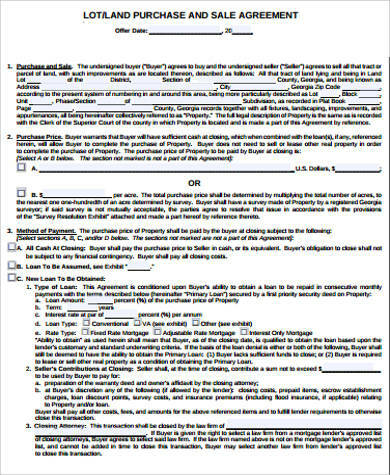 For those who need to obtain loans, please check out our Loan Agreement Forms. These can help guide you on the terms and conditions when making a loan and will help you with the specifics before applying for a loan.